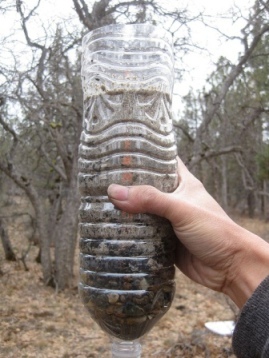 A homemade charcoal water filter is fairly easy and inexpensive to make. Charcoal is the filtration media that many of our ancestors used to filter contaminated water. Charcoal is a carbon, a porous material that attracts and holds many harmful contaminants. The charcoal becomes activated when it is mixed with oxygen, and then millions of tiny pores open up between the carbon atoms causing higher adsorption. Homemade charcoal water filters may reduce the amount of harmful organic chemicals as well as many inorganic substances found in ground water or tap water. Even though there are limitations on what types of contaminants a homemade charcoal water filter can remove from water, knowing how to make one is a good thing to know, especially during emergencies or on camping trips. However, the only way to ensure that all harmful pathogens have been destroyed is by boiling the water. You cannot count on the homemade charcoal water filter for sterilizing the water. Thus, we always recommend boiling the water, preferably after you filter it through a charcoal filter. The charcoal filter will remove sediment, other harmful contaminants, and will improve the taste. The boiling will ensure you will not get sick. Collect fresh charcoal from a campfire that has cooled completely. Crush the charcoal into powder and small bits of gravel. Find or create a tall cylindrical container (such as a 2-quarter plastic bottle with the larger end cut off). Use a piece of cloth or a bunch of tightly packed grass to fill the smaller opening of the container. This is to prevent the charcoal from coming out with the water. If your bottle still has a cap, poke a hole in the cap before filling it with the cloth or grass. Then fill half the container with tightly packed crushed charcoal. The purpose is to create a close-knit filter so that as the water drips through slowly it will collect more sediment. If the water flows through the container rather than dripping, the charcoal is not packed tightly enough. It should drip slowly for the most effective filtration. If possible, place another piece of cloth, sand or packed grass on top of the charcoal. This will help prevent the charcoal from moving around when water is added. Put your filter container on top of the pot where you will be boiling your water (first choice) or another jar or container to catch the filtered water. Then slowly pour the source water through your filter, allowing it to drip slowly out the bottom of your filter into the pot. When all the water has run through the filter, pour it back through again 2 or 3 times, until the water is clear. Once the water is clear, sterilize the water by boiling it for a few minutes.